Alaska, Land Of The Midnight Sun... Just the name itself carries a sense of greatness. For years, Alaska has been known for its wondrous size, its magnificent mountains, its trophy size game, and of course its salmon fishing and pike fishing. Midnight Sun Alaskan Fishing Adventures offers luxury & comfort, while enjoying Alaska's remote wilderness. 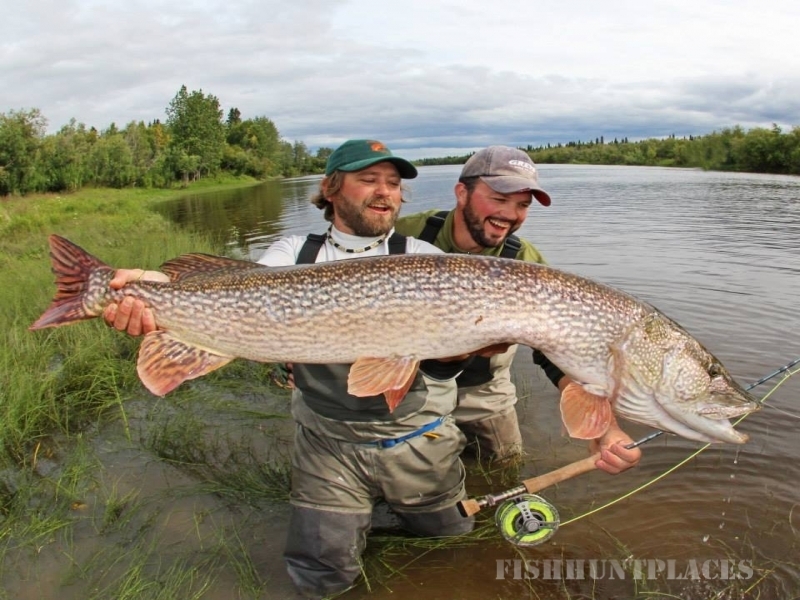 Our professional Alaska fishing guides provide a level of experience, knowledge and enthusiasm that ensures the fishing trip of a lifetime for those anglers interested in hooking the largest pike they’ve always dreamt about. We'll provide the expertise you need on the fish and their habitat, gear, fishing techniques, casting, and how to catch that trophy fish of your dreams. Custom trips are also available on other Western Alaska Rivers. Alaska Northern pike wait to ambush their pray while patiently waiting in the back bays and grassy sloughs they call home. Pike are the fastest accelerating fish in the world and come armed with 702 teeth. Alaska Pike weigh an average of 7 pounds and their fierce wake will strike fear in the hearts of most hardened pike fisherman. It’s best to be cautious when fishing for Pike in Alaska, we’ve seen 40" pike lurking in the muddy waters. Our Alaska fishing trips also target Sheefish. This fish has a strong bite and is fast moving. Sheefish migrate in schools up river throughout the summer months. These unique fish provide quick and ferocious action for the spin cast, or fly fishing enthusiast. Come join our Alaska guided fishing service to experience some of the most amazing fishing found on the planet. All of our fishing guides are highly experienced and will get you hooked up with amazing fish! Guests will get to enjoy the accommodations aboard our beautiful 67 x 16 foot houseboat called the 'Midnight Sun'. Providing an exciting twist to remote fishing in Alaska; this houseboat is designed with all of the comforts of home and comes equipped with all the modern amenities for up to six guests per week. The boat has three staterooms, each sleeping two guests. There are two bathrooms providing full shower, sink and commode facilities which are shared by all guests. The upper deck has a fully covered and screened in 45 x 16' area creating a lot of space for those wanting to enjoy a bug free quiet drink and watch Alaska's midnight sun skirt the horizon. We also offer Yukon Guided Tent Camps for our more adventurous clients. Located in even more remote areas of the Yukon drainage, the ability to fish in areas that have never seen a fly or lure has never been more real. Large cabin tents with cots are provided per every two anglers. The cots ensure that no mud will get in your way of a perfect nights sleep by the river. Sleep peacefully at night to the sounds of nature and see pike takes during the day that are jaw dropping. Call today to begin planning your Alaskan vacation adventure of a lifetime.